chin is part of the Basic English 850. (countable) The chin is the lowest part of the face. 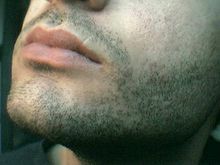 It is the point of the jaw and the part of the face where beards grow. My chin is below my mouth. This page was last edited on 1 February 2018, at 23:49.